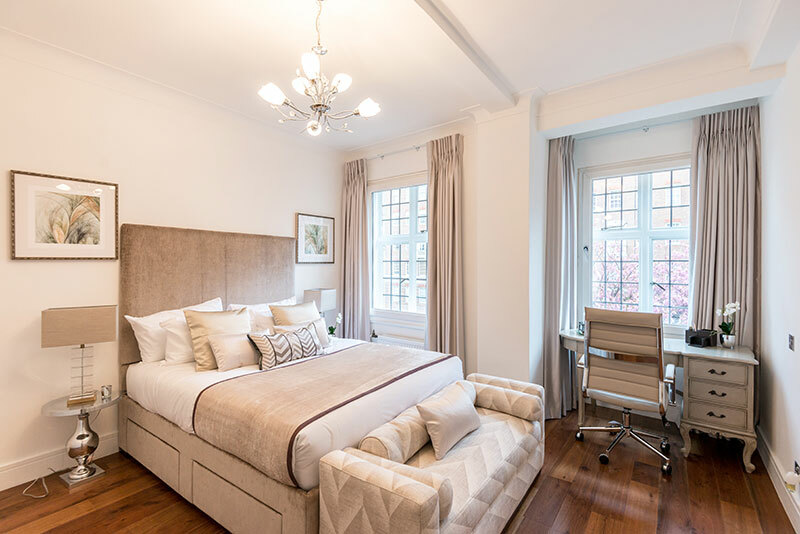 Attaining a transitional style interiors was the order of the day when we recently furnished this stunning two-bedroom apartment in St John’s Wood. The home was a holiday abode to the family, due to the diversity in aesthetic taste amongst its members, it was important to our client that each of the rooms in the house was furnished to suit individual tastes – but, of course, it was also critical that the design of the home flowed from room to room. Natural, stone-based colours were at the heart of our thought-process. We worked closely with our client, and ensured we picked the correct pieces of furniture that helped add life to this newly refurbished blank space. In the spacious, open plan living and dining area we introduced simple yet stylish design, created with practicalities of family life in mind. 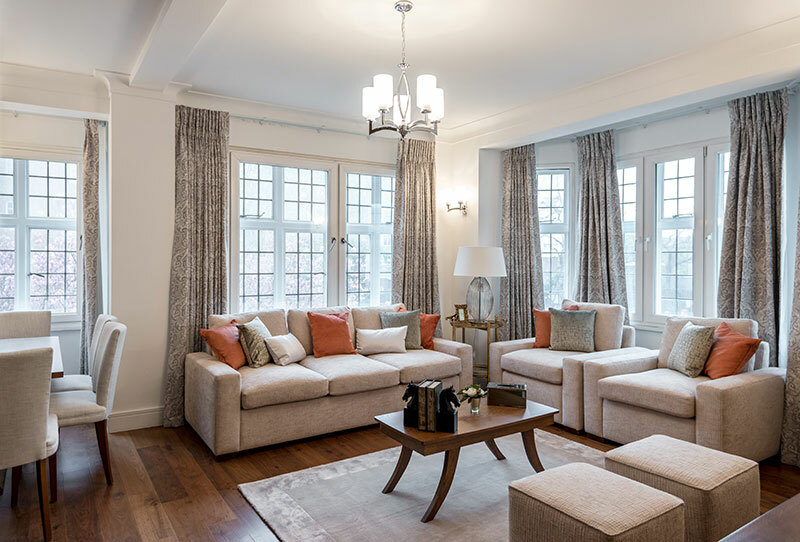 We placed a magnificent sumptuous sofa that took center stage alongside two matching armchairs and foot stools – meaning plenty of space for the family to kick back and relax together. A modern table lamp, accompanied by a sleek coffee table created a practical yet elegant space. 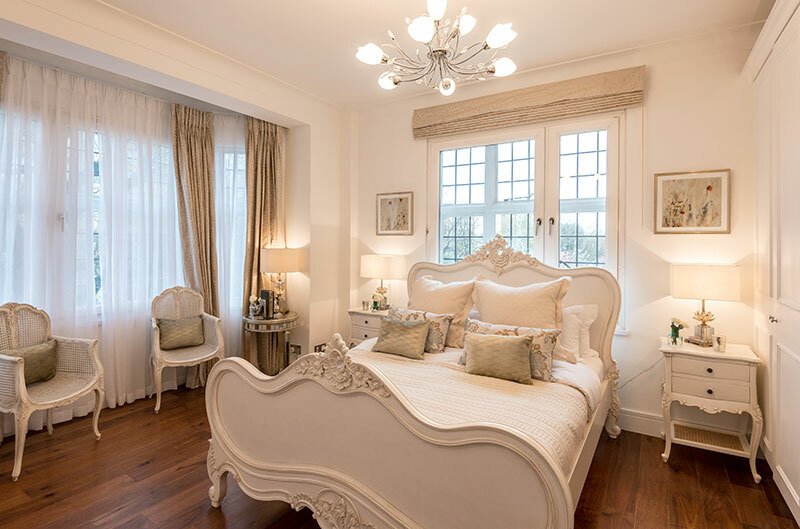 As our client is a self-confessed lover of all things neoclassical, we carefully selected a range of French-style and baroque-themed furniture for the master bedroom. 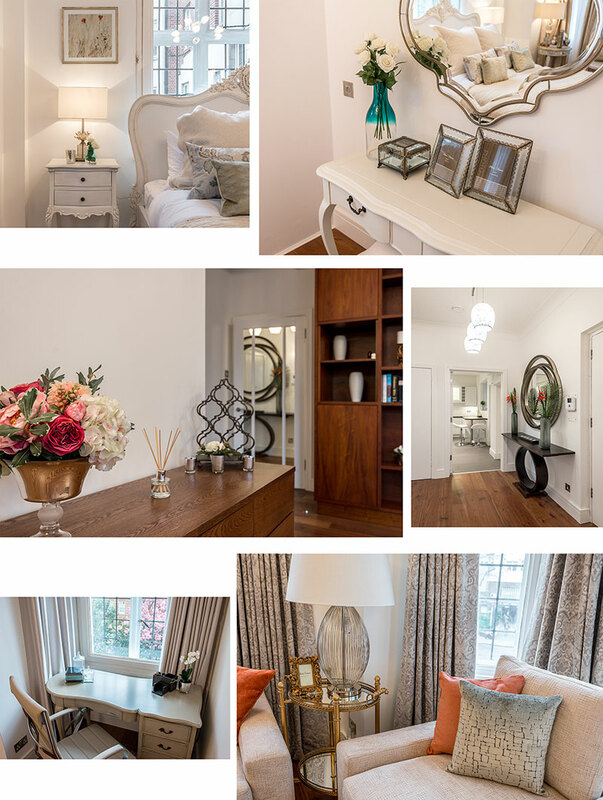 Opting for a chic, neutral colour scheme, we were able to create a luxurious, inviting space with a distinct conventional look and feel. For the younger generation of the family, it was less about the old-fashioned and more about clean, contemporary design that also had a homely feel. Opulent lamps with clean-cut details were added to the bedside tables and a zigzag-patterned sofa for the end of the bed established a youthful and relaxing vibe. As a result we had a home that was a perfect mix of traditional and contemporary design, with a handful of captivating modern touches that left our client and his family thrilled. Has our work at this gorgeous family home inspired you? Get in touch for more details about our bespoke interior design service.